Holmes & Watson along with President Donald Trump dominated the 2019 Golden Raspberry Awards. The Razzies have been going on for the past 38 years, taking the worst that Hollywood has to offer and giving the movies and performances their very own special recognition for the year. 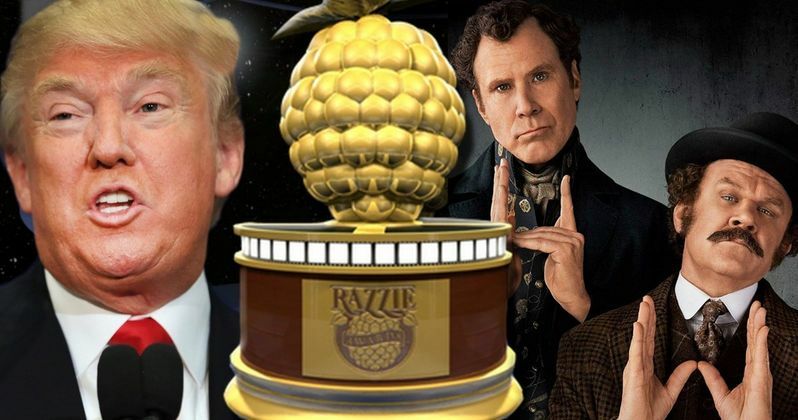 Much like the Academy Awards, which air tomorrow evening, the Razzies saw some controversy this year when their academy was accused of voter fraud at the end of January. However, the annual event seems to have smoothed everything out since then. Holmes & Watson took home the Razzie for Worst Picture, Worst Director (Etan Coen), Worst Supporting Actor (John C. Reilly), and Worst Prequel, Remake, Rip-Off, or Sequel. There was some pretty stiff competition this year, but everybody knew that Holmes & Watson was destined for Razzie glory the moment that it hit theaters late last year. It has been reported that the studio desperately tried to sell the movie to Netflix in an attempt to bypass theaters altogether, but the streaming platform decided against it. Many assumed that Will Ferrell was going to take home the Worst Acting Razzie, but a surprise twist occurred. Instead, President Donald Trump won Worst Actor for his work on Death of a Nation and Fahrenheit 11/9 as himself. Trump "and his self-perpetuating pettiness" took top honors in the Worst Screen Combo category for both of the aforementioned documentaries. Trump administration political counselor Kellyanne Conway took home the Worst Supporting Actress Razzie for her work on Fahrenheit 11/9 as herself. Trump has yet to respond to his Razzie wins, but one can assume that he will be very happy about the awards. Melissa McCarthy also took home some Razzies this year. The actress won Worst Actress for her work on The Happytime Murders as Detective Connie Edwards and Life of the Party as Deanna Miles. However, Will You Ever Forgive Me? was awarded the Redeemer Award of the year, so all is not bad for McCarthy this year. The Razzie for Worst Screenplay was given to Fifty Shades Freed's Niall Leonard; based from the novel by E. L. James. Finally, Billionaire Boys Club took home the Larry L. Bumstead due to the fact that it was a critical and financial failure that would've been nominated if it had received an eligible release. The Golden Raspberry Awards have come under fire in recent years when it was revealed that their academy doesn't even have to watch the movies that they vote on. The annual ceremony has also been criticized for giving anybody who pays $40 the right to vote on the awards that are given out. Regardless of the criticisms, the Razzies soldiers on and highlights movies or actors that did a pretty bad job over the course of the year. With that being said, it's all in good fun. You can check out the official winner list over at The Razzies official site.